1Assistant Professor, Department of Management, Faculty of Literature and Humanities, University of Guilan, Rasht, Iran. 2Professor, Department of Human Geography, Faculty of Geography, University of Tehran, Tehran, Iran. Purpose: One of the strategies to develop rural regions in most countries is to promote rural tourism. One of the features of rural tourism is its fragmented physical nature; therefore, in recent years, the rural tourism networks are of great concern in this regard. In most countries, the importance of rural tourism networks concept is rising. In the economy of many countries, this concept works better in tourism than other sectors. An analytic approach on rural tourism networks and its application in the development of tourism is essential. One of the most important contributions of tourism is flourishing related and marginal businesses. In the current study and based on ground theory, we attempted to analyze rural tourism networks in mountainous-valley route of Haraz rural areas. 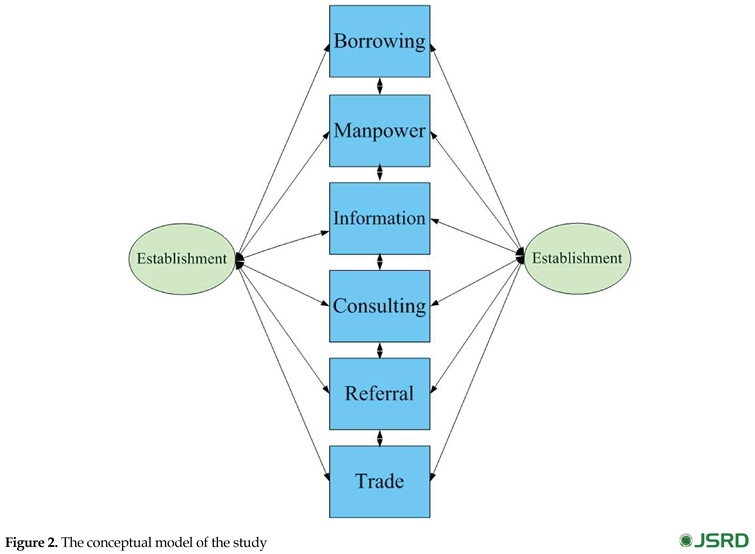 Results: The most important network cooperation is found among the borrowing, manpower, information, consulting, revising, and trade. Conclusion: In general, the obtained results indicated that regarding business network cooperation, the conditions were not in good condition. In most rural areas, the economy has declined to a point where the income from traditional agricultural activities has reached below the average per capita point income. Moreover, the Tourism is considered as one of the major factors in the development of countries; and the rural tourism in its specific sense would satisfy the tourist’s need and relive the above mentioned problems, if planed and organized properly, by considering the domestic, economic, social, and cultural features (Ghanian, Khani, & Baghai, 2011). Tourism is one of the major factors in the development of countries. The rural tourism in its specific sense would satisfy the tourist’s need and resolve the above-mentioned problems, if properly planed and organized, i.e., by considering the domestic, economic, social, and cultural features (Ghanian et al, 2011). Accordingly, rural societies seek measures to create variety in the rural economy. Tourism is one of the major industries with the ability to assist the local economy by creating job varieties in the given area (Allen, Hafer, Long, & Perdue, 1993; Davis & Morais, 2004; Hassan, 2000; Long, Perdue, & Allen, 1990; McGehee & Andereck, 2004). Employment of the network conception in the tourism literature makes sense and leads to analytic conclusion with respect to objectivity and systemization. Fragmentation in the tourism concept is an old subject of discussion in academic literature (Leiper, 1990; Palmer & Bejou, 1995; Wang & Fesenmaier, 2007). Geographically speaking, tourism attractions are located in regions faraway, where the main markets are small and independent businesses are active in an unorganized working environment. In such regions the survival of the newcomers depends on the group work (Dollinger, 1990). In fact, tourism is a defined system where the interrelations are necessary (Bjork & Virtanen, 2005). Hence, cooperation among the different tourism goods producers and service providers and institutions is fundamental (Tinsley & Lynch, 2001). In a sense, the small size of tourism businesses and their segregation force them to join for greater sustainability. Their coexistence contributes to the local economic welfare. Some developed regions due to rural tourism in recent years are located in the Larijan District of Amol City in Mazandaran Province, Iran. The current case study was conducted on the regions where rural tourism is totally evolved. This region is not far from the capital city, Tehran, Mazandaran, Alborz etc., running along the Haraz road with many natural attractive sceneries and numerous visitors. This area was selected with respect to the essence of the tourism business cooperation. 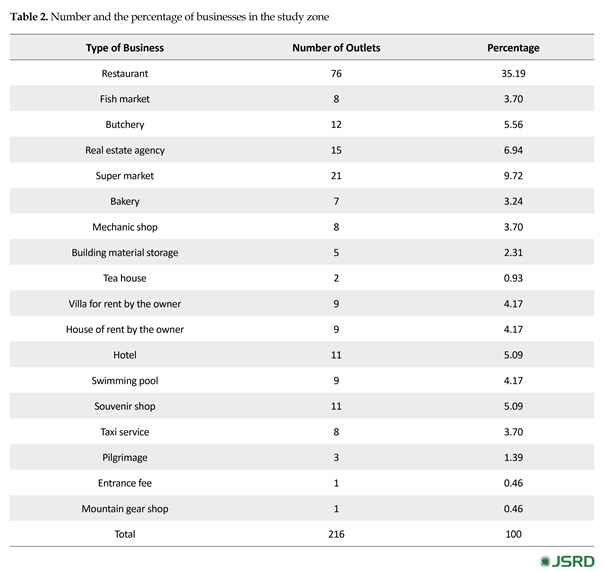 In this study, various relations among the local restaurants and influencing factors on them were identified and analyzed. Today, tourism is one of the most important endeavors accompanied with changes in the perception of the landscape, manmade/artificial features, sociopolitical and cultural aspects, and lifestyle in general. According to tourism 2020 vision, 604 million tourists all over the world, in 2005 generated more than $ 800 million (transportaion costs not included). The World Trade Organization (WTO) predicts a total of 1561 million travels in 2020. According to the same researchers, tourism can be considered as a new revenue source in enhancing the local economies by creating job opportunities, which can save the rural areas from poverty (Fossati & Panella, 2000; Giaoutzi & Nijkamp, 2006; Lee & Chang, 2008). In the current study, the restaurants of the study area with their attractive features and year-round operation are of concern. They have high potential to attract tourists, as they are close to big cities and located on the main routes. In this regard, the out-ward aspects and the positive influence of tourism can be formed in the progression of the related businesses by the network and cooperation. The concepts of network and network analysis technology are tools to visualize and analyze the nature of the relationships involved in this realm. These tools provide the method to simplify and make these relationships consistent with one another to achieve effective objectives. Since secluded small entities cannot last long, the network approach would keep them up running (Halme, 2001). The networks, either local, unofficial, or established based on formal agreements, are beneficial for the national regular local tourism organizations, and compensate to the segregated nature of this industry. These network structures satisfy the needs of active sectors in rural tourism and a lot more. The presented definition of network and network analyeses (social network analysis) consists of an approach and a set of techniques to find sources among the active entities, individual groups, or organizations (Haythornthwaite, 1996). The techniques applied in the network analysis are significantly different from those of the statistical ones which need independent analytical units. Collective network analysis is applied in drawing correlative patterns among the active entities and their structures. The analyses are made by collecting the relevant data, systemizing them in a matrix, and calculating their diversified features such as congestion or centrality. This analysis is beyond a set of analytical strategies and as it deals with the structure, it can be a tool to fit the emotional structures as well. Hence, the network analysis is synonymous for structuralism. The structure among the nodes (the analytical unit in network literature) and the stance of the nodes in the network incorporate judgmental, cognitive, and behavioral consequence for the single units, and the collective ones as a whole. Schmettman et al. (2011) reported that the associations modeling can be used to describe some aspects of the behaviors involved in individuals. Therefore, the network analysis can be considered similar to the theoretical approaches. Network analysis and scientific methodology constitute the evaluation and recognition of practical relations among the study issues and their structures. These nodes can represent individuals, objects, groups, concepts, occupations, enquiries, feature dimensions, and clusters at different levels. This analysis can describe the external facts as an orderly and condensed network and provide summary saving, retrieval integration, and visualization of the data. The perception of network is of 2 widely expanded conceptual schools: the mathematical and social sciences, which somewhat integrated in the mid-20th century. Network analysis in business and economics introduced a new systematic paradigm based on the merits of axiomatic rows. The ongoing studies regarding the networks follow 4 major objectives: 1) recognition of the integration and cohesion of societies or the phenomenon subject to study, 2) recognition of the nodes acting as hinges, 3) recognition of the specific and weird network structures, and 4) finding the answer to how the data are modeled and analyzed (Dooremalen & Borsboom, 2010). The history of general management and business network is always the center of attention, but in tourism realm it is almost a new concept. 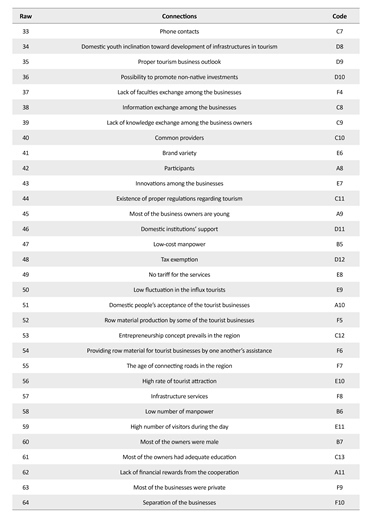 Lynch (2000) made an analysis regarding the literature of tourism network and identified some measures beneficial to tourism. They categorized these advantages in learning, trade off, and occupational and associative frameworks (Table 1). The tourism network constitutes certain groups with common interests and active entities operating at local or regional levels. It is assumed that the thriving network fits the content of Table 1. This can occur at a specific time or period, with respect to the network objectives. The researchers in tourism note that the network analysis is appropriate in this field and also tourism is an excellent networking industry. Tourism is defined as a system where inter-affiliations are necessary (Bjork & Virtanen, 2005), also cooperation among different institutions and organizations involved in any aspect of tourism on a cooperative business is essential to serve the purpose (Tinsley & Lynch, 2001). Presence of the network structure is vital in group activities with respect to rural tourism. This almost new phenomenon could improve the tourism business and provide inter-organizational trading, exchange of knowledge, and quality improvement at social level. The current study adopted the grounded theory methodology, an analytic method to construct the hypothesis through inductive qualitative data (Charmaz & Bryant, 2010). This method is concerned with constructing the concept in addition to providing a collection of principles for the study process known as total methodology. In the last 4 decades, this method gained a vast popularity as a valuable systematic method to collect and analyze data. It is vastly adopted in business and marketing. The features that distinguish the grounded theory method are as follows: generation of a conceptual framework based on the available data, revealing the main processes in the social realm instead of describing the unit under observation, comparing each datum with whole data, making the data accumulation pattern change possible in the field of study, and promoting the expression of the thoughts about the report as the data collection begins (Papzan, Ghobadi, & Gravandi, 2010). 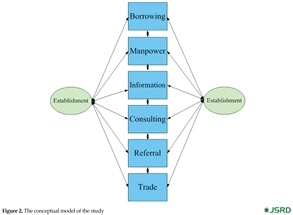 This method consists of 5 stages: 1) study design (assessing the technical literature and selecting issues), 2) data accumulation, 3) controlling the data, and drafting the terms and concepts, 4) data analysis, and 5) designing and verifying the model (Ghobadi, Papzan, Zarafshani, & Geravandi, 2012). The data analysis consists of the open, axiomatic, and selective coding stages (Ghobadi et al., 2012). In the current study, in-depth interviews with centralized groups were done to collect data. The statistical population consisted of 216 potential investors (Table 2) in the study area and the sampling followed the snowball effect method, resulting in the selection of 40 candidates. At least 35.5 hours were spent on interviewing with 40 local businesses to obtain the theoretical notions. The interviews were continued until the data saturation. During the interviews, in addition to taking notes, the interviews were recorded, which were very helpful in producing the final manuscript. 1. Transit travelers who enjoy the scenery, weather, and all served in a maximum 24 hours. In fact, they cannot be considered as visitors. Most of the villages under study were on Haraz Highway with their shops open to sell domestic farm and dairy products. Restaurants and a variety of service centers are open for travelers, too. The transit traveler/tourist has less effect on their business; i.e., no significant impact on rural wellbeing. Of course, there are some authentic restaurants on this route and in the villages, which attract customers from far away for their quality food and beautiful scenery. 2. The non-transit travelers with their own accommodation in the rural areas. Naturally, their stay is long and they have to pay for the services provided by the villagers. 3. The ones who come to enjoy the natural beauty of the region and of course pay for the services provided by the villagers. The major services they pay for are accommodation, mineral water treatment centers, retail shops, etc. The number of business units here is 216 while 10.45% of which were founded by non-local and the rest by local investors. The collected data were reviewed several times. The issues not related to the subject were eliminated; the main conversations were set in the tables with no categorization, and then, coded through categorized axiomatic manner. 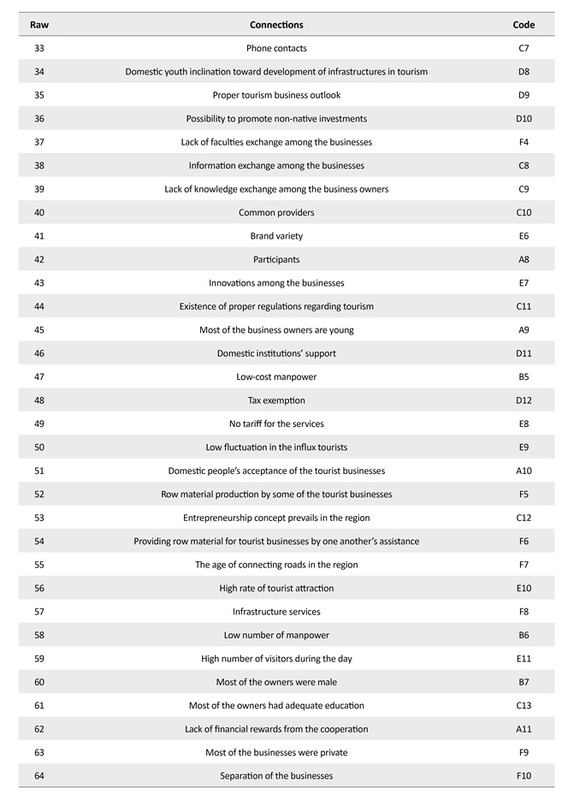 In open coding, the statements or the concepts regarding the attractive factors on investment were extracted and coded in 106 items (Table 3). Next, the related concepts were coded in similar frames. The results obtained from open coding based on the concepts were categorized and presented in Table 4 on an axiomatic manner. Based on the findings at open and axiomatic coding stages, the connection among the sections were determined and modeled conceptually (Figure 2). In tourism industry and in particular the rural tourism, most businesses are small or medium (SMEs) and family oriented with their considerable contributions to the regional economy in all respects. Globalization has put the tourism business under pressure; however, it can provide opportunities for the world free market manipulation. Accordingly, the rural tourism destinations should establish strong networks of cooperation among the tourism business based on the developed strategies to resist the competition on international basis. These networks should operate as a collection of establishments with a common goal. The segregated nature and the variety of the content of this industry are well known that entails the interaction among the beneficiaries with respect to planning and management towards development of this industry. technology are the main subjects discussed and analyzed in the network context. The resultant of networking includes making necessary data provision and supply, and finding legitimate routes for the information flow (Haythornthwaite, 1996). Tourism is an industry with high interdependencies where evolution is a necessity. Cooperation and correspondence are vital in this industry (Novelli, chmitz, & Spencer, 2006). The business networks find the essence of these activities in social relationships. Mitchell (1969), the classic sociologist, identified 3 different manners regarding the content of social networks connections: realization of the exchange, correspondence, and the social issues. Ndou and Passiante (2005) expressed that the institutions, when member of a network, can achieve better performance through better opportunities, advances in quality, flexibility, and innovation. Novelli et al. (2006) believed that expansion of the networks should not be considered as self-sufficient processes, but complex ones where the strong cooperation of the beneficiaries is a must. Scott et al. (2008) evaluated network structures in 4 destinations in Australia and found that the information flow among the involved activities constitute the basis to analyze the network for determining its consistency. Isabel-Polo and Dolores (2010) introduced a tourism network in Adolos region, Spain, and distinguished the advantages of such an attempt as better performance of the establishments, improvement of socioeconomic status, and promotion of the general image of the region in the visitors’ views. Morrison and Thomas (1999) stated that small businesses face problems such as low budget and lack of expert management and marketing. 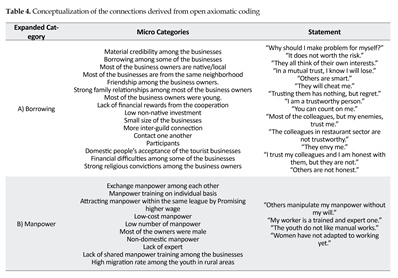 According to Andriotis, lack of knowledge about other occupations, cooperation, and connections in this sector expose small businesses to difficulties. The current study attempted to evaluate the cooperative state of the restaurants in the study area through network analysis approach and semi-structured interviews during 40 direct interviews lasted at least 35.5 hours which took place in 8 months. We tried to concentrate on major issues such as borrowing, manpower, information, consulting, referral, and trade, as well as the most effective factors such as family relationships, friendship, neighborhood, nativity, membership in cooperatives, trust and hate, accompanied with the connecting channels such as face to face talks, telephone, website, virtual social networks, etc. The first subject of discussion was “borrowing” and the results indicated a sound relationship between the business and the members of their tribes who provided financial support, living more than 100 km away from the business point. Trust was the most effective factor in “borrowing,” in general. In this region, this factor ranked the worst, especially when it came to nonlocal borrowers. 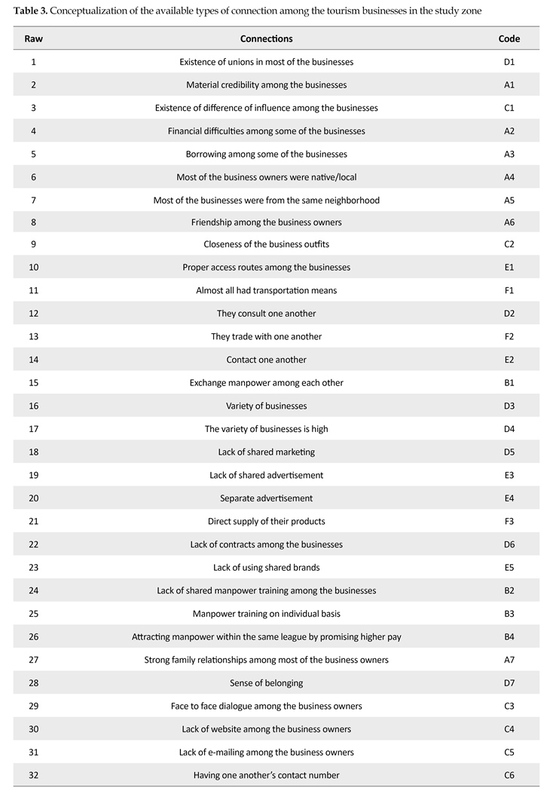 Most business owners said that they did not trust others and preferred to operate alone. More such statements were quoted in the statement column of Table 4. Manpower displacement was the other major factor, especially when they were not native. 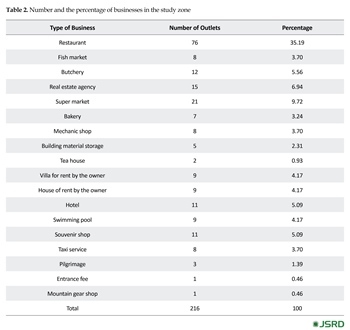 In these businesses, 24.28% of the manpower were the members of the same family/tribe whether from the same local area or city or provinces close by. One of the major drawbacks was their training. For example, when one is trained at the expense of one and then leaves and works for the other for presumably a better pay. It mostly occurs in restaurant industry. In top rated restaurants, the labor issue is more organized, i.e., there were contracts, insurance coverage, etc. In medium and low rated restaurants, the manpower fluctuates according to the service demand. One of the other major connecting factors is the data exchange among the businesses in areas such as economic (bank inspections), social (public non-material support), political (conventions and cooperative meetings), and so on. This factor prevails at the lower rate businesses. In the association of restaurant owners, the famous ones have the last word regarding their guild. The first grade restaurants, due to their strong management and relationships with the authorities get the first hand information and then pass it down to lower levels. The family ties have an important role in the overall structure of these guild networks. The obtained results here indicated that work-referral among the businesses was usually a common practice in the low rated restaurants. Food-referral among these restaurants was common as well as satisfying the costumers’ needs regarding the type of food. It was the case with top rated restaurants; of course here the high price was the reason for this referral. Consultation on different issues among the businesses was limited, and if there was, it took place within the family circle of the business owners. According to the interviewed subjects, this factor did not progress as there was not enough trust among the business owners. This distrust cannot last long, since as the sense of networking is being promoted, the trust has to prevail. In general, the obtained results indicated that regarding business network cooperation, the conditions were not at average level. The current research has not received any financial support. Charmaz, K., & Bryant, A. (2010). Grounded theory. In P. Peterson, E. Baker, & B. McGaw (Eds.). International Encyclopedia of Education (3rd ed.) (pp. 406–412). New York: Elsevier Science. Dooremalen, A. J. P. W. & Borsboom, D. (2010). Metaphors in psychological conceptualization and explanation. In A.
Toomela & J. Valsiner (Eds. ), Methodological Thinking in Psychology: 60 Years Gone Astray? Charlotte: Information Age Publishers. Fossati, A., & Panella, G. (2000). Tourism and sustainable development: A theoretical framework. In A. Fossati, & G. Panella (Eds. ), Tourism and Sustainable Economic development (pp. 3-36). Boston: Kluwer Academic Publishers. Ghanian, M., Khani, F., & Baghai, L. (2011). [Evaluation of entrepreneurship climate in rural tourism (Case study: Oraman region) (Persian)]. Journal of Rural Research, 2(3), 99-123. Ghobadi, P., Papzan, A., Zarafshani K., Geravandi S. H. (2012). [The study of rural tourism in Khangha village as perceived by rural villagers: A grounded theory approach (Persian)]. Journal of Housing & Rural Environment, 31(137), 71-82. Giaoutzi, M., & Nijkamp, P. (2006). Emerging trends in tourism development in an open world. Aldershot: Ashgate. Granovetter, M. (1985) Economic action and social structure: The problem of embeddedness. American Journal of Sociology 91(3), 481–510. Gravandi, S., Papzan, A., & Afsharzadeh, N. (2012). 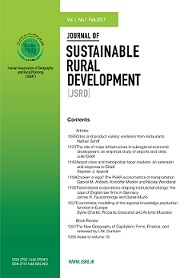 Modelling sustainable environmental development using grounded theory (Case-study: Sharveineh Village, Javanroud Township). Journal of Housing & Rural Environment, 30(136), 67-78. Gray, B. (1989). Collaborating: Finding common ground for multiparty problems. San Francisco: Jossey-Bass. Isabel Polo, A., & Dolores, F. (2010). 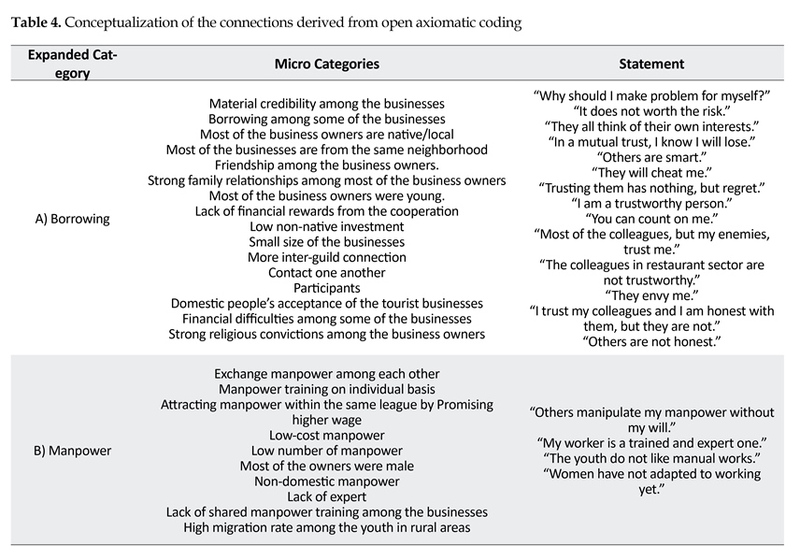 Collective strategies for rural tourism: The experience of networks in Spain. Journal of Tourism Consumption and Practice, 2(1), 25-45. Kotler, P., Haider, D. H., & Rein, I. (1993). Marketing places: Attracting investments, industry, and tourism to cities, states and nations. New York: Free Press. Ndou, V., & Passiante, G. (2005). Value Creation in Tourism Network Systems. 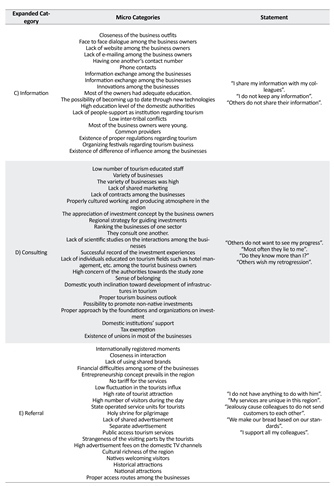 Information and Communication Technologies in Tourism 2005, 440–451. In A. J. Frew (ed), Information and Communication Technologies in Tourism. Vienna: Springer. Papzan, A., & Ghobadi, K., & Gravandi, S. (2010). Study problems and limitations of rural tourism using grounded theory; The case Harir village. Journal of Rural Research, 1(3), 25-52. Sztompka, P. (1999). Trust: A sociological theory. Cambridge: Cambridge University Press. World Tourism Organization. (1999). Tourism 2020 vision (Executive summary). New York: World Tourism Organization. Dooremalen, A. J. P. W. & Borsboom, D. (2010). Metaphors in psychological conceptualization and explanation. In A. Toomela & J. Valsiner (Eds. ), Methodological Thinking in Psychology: 60 Years Gone Astray? Charlotte: Information Age Publishers.